The following post was based on “Will HTML5 browsers become the new go-to VDI client?” by Brien Posey, published on Nov 2, 2016, on Tech Target. More and more browser-based clients are slowly becoming the standard as many cloud-based applications are using the browser interface. HTML5 clients enable users to access remote desktops and applications through a Web browser which lets them work from any device, anywhere. When HTML5 first emerged, the user experience needed some improvements, but now browsers use protocols that make it simple and easy to use. It has become an everyday practice for companies to use a mix of Windows and Linux based applications combined with SaaS. Likewise, end-users use a mix of alternative devices such as Windows PC`s, Macs, Android and iOS tablets, Linux PCs, Chromebooks, smartphones and more. The browser is something that links all these different devices together. “The one thing all of these devices have in common is the browser. Although not every browser manufacturer adheres to the HTML5 standard perfectly, just about any current device should be able to render HTML5.” writes Brien. Almost every device today is able to render HTML5. Because HTML5 applications don’t need plug-ins, users can access their desktops from any device with a compatible browser over any Internet connection. In today`s world of mobility, that’s a big advantage. There are many comparisons drawn between VDI, RDP and HTML5 browsers. 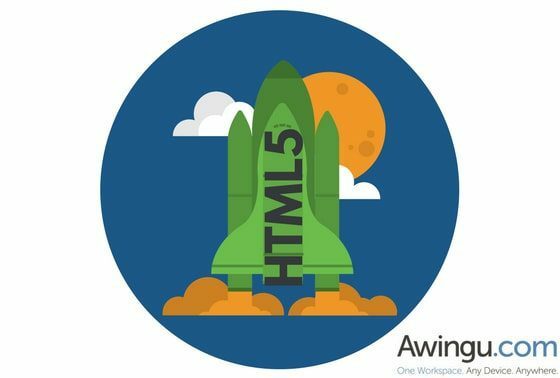 To step away from comparisons and focus just on the HTML5 benefits, here are 3 major points why HTML5 browsers are becoming a universal client. SIMPLE TO USE: VDI usually requires a client to be installed locally on a device to send, receive and render remote protocol data. HTML5 always runs in the browser. No admin, no local installation and no configuration make HTML5 a simple and easy to use the medium. NO LOCAL DATA: All data resides in the company`s infrastructure and there are no leftovers on the end user device. As a result, there is more security as there is no local data saved anywhere. GREAT UI/UX: HTML5 is becoming a fully mature technology to build full blown applications. Developers can useHTML5 to create full-blown web applications that would have been impossible to build with earlier versions of HTML. Another advantage of using HMTL5 browsers to access remote desktops is that they don’t look or feel significantly different than desktops accessed from a local client. Awingu unifies all the company files and applications into one, a secure online workspace that is accessed from any device using an HTML5-based browser. Our solution brings the flexibility and mobility of HTML5 also for legacy apps that are not written in HTML5. As such, Awingu can enable a full digital transformation and a gradual move into the cloud for businesses of all sizes. Try our solution for 14-days free or join one of our webcasts to know more about our solution!